March 6, 1977 Published by the "Upper Room"
I run straight toward the goal in order to win the prize, which is God’s call through Christ Jesus to the life above. While sowing wheat, it was necessary for me to lay off new land. My husband wanted the large field cut in thirds as a precaution against wind erosion. He told me if I aimed the tractor at a certain mark, the field would be divided equally. I started with confidence, but became confused about the mark, one-half mile away. Before reaching the other side of the field, I changed course three times. It was too late for me to start over, and there was no way I could erase the crooked row. This mistake would make the other fields uneven also. Our daily living is plain for others to see- whether good, bad, or in-between. In our Christian living, do we become confused and waver uncertainly before we reach our goal? How much better our witness would be if we did not waver but kept our eyes on Jesus. Straight footsteps are much easier for others to follow! PRAYER: Dear Jesus, Thank You for this day You have given us. We ask for Your guidance in our every thought and deed. May our lives today be to Your honor and glory. Amen. Her family moved to Denver, Colorado where she attended elementary school. Fred, Edith, Ruth, Ramona, Don and Bob moved back to Gate during her middle school years. Ramona graduated high school at Laverne, Oklahoma. She would stay some with Margaret Stuart while she was attending school and working during the summers. 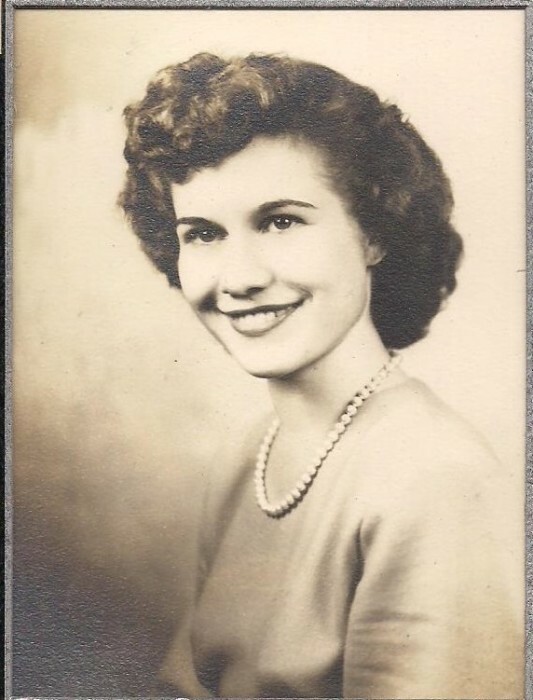 Ramona enjoyed being a ticket taker at the theater in Laverne, working at the dry cleaners, and being a soda jerk at the Delhotal Drug Store. During school hours, she and Margaret would walk to the drug store to get a coke. The only thing the superintendent would say was “Get the school mail on your way back”. She had great memories and stories to tell about her classmates at Laverne High School. Ramona’s greatest joys were her grandchildren given to her by Karl and Charlene. Cherinda, Kareece, Janee’, and Ryan were treasured and loved. Delvin often said that he wished he was her grandchild! She made Barbie and Ken clothes, stuffed animals, personalized activity books, quilts, many articles of clothing…all handmade with tender loving care. Prom time included trips to the fabric store to pick out patterns and materials for Cherinda, Kareece or Janee’s dresses and Ryan's vests and ties. Ramona also made Halloween costumes and His Team drama costumes for the "Toymakers Dream" production. The grandkids loved to help pick and pit cherries, pick vegetables from their big garden, go with them to check cattle, help bake cookies, and just spending time with them. Ramona was the go to person for all 4-H Clothing projects and taught each granddaughter to sew. With her help, Cherinda, Kareece, and Janee’ would always place or win with their Make it With Wool contest entries. She also helped with the 4-H Home Environment projects that enabled Cherinda and Kareece have winning record books. Grandma Mona and Grandpa Delvin attended all of their grandchildren's many school, 4-H, FFA, and church activities. They were proud of their grandkids and were their biggest fans. They always looked forward to them coming back to the farm to visit.